The Town of Irvington, platted in 1905 east of Lafayette, Colorado. Homes and retail establishments east of pre-Lafayette were scarce. Until Lafayette businesses were established in 1889 and 1890, pioneer families such as the Barrowmans and Harmons followed a trail along Coal Creek to buy provisions in Louisville. Barrowmans owned or farmed most of the land east of Lafayette along Coal Creek. Their farm house was located about where today’s Lafayette Water Reclamation plant sits at County Line Road and Highway 7. The area along both sides of today’s Flagg Drive is the east half of Section 1, Township 1 South, Range 69 West and is historically known as Irvington, Colorado. The land was under control of Denver coal speculators from its patent date until 1905. Prominent Denver industrialist E.B. Light shared ownership of the property and incorporated as Baker Land & Coal Company in 1892. Several years prior, Light and his partners had leased coal rights to the Standard Mine, which opened around 1890. Prior to 1905, no portion of the east 1/2 of Section 1 was subdivided or sold. (Baker Coal Company executives swapped 1/3 and 1/6 interests on several occasions, but the land stayed within the company’s ownership.) The 1899 Willits Farm Map misidentifies the land as “Boulder Land & Coal” but shows one structure on the hillside near the Adams (Broomfield) County/Boulder County line. The “Marfell shaft” is also misidentified. Marfell’s mine was along 119th Street closer to Erie. J.P.P. Odell and the revamped Irvington Coal and Land Company, formerly Baker Coal, platted Irvington in 1905 with a liquor clause similar to Lafayette town founder Mary E. Miller’s — “no spiritous, vinous, or malt liquors shall ever be sold or given away as a beverage.” The Irvington platting included 25-foot-wide lots with the main avenues of Rankin, Park and Hurlbert. What J.P.P O’Dell didn’t know when he submitted his plat was that Irvington sat almost entirely in the flood plain for Coal Creek. During a catastrophic June 1921 flood, four houses in Irvington were washed away and “the grocery store of Mrs. Ernest Johnson was filled with 6 feet of water.” No one was killed during the flood, but farmers along the creek lost hundreds of livestock. The east-west segment of Flagg Drive connecting onto 120th east of Lafayette was at one time a trail used by coal miners to get to and from work. Two large mines, the Standard and the Capitol, operated near Flagg Drive between 1890 and 1929. At some point before about 1920, a landowner fenced off the trail. A subsequent lawsuit over the use of the social trail resulted in the designation of a public right-of-way, which is the reason that the two road segments of Flagg Drive connect today between Highway 7 and 120th. About 30 lots were sold in Irvington, and a 1922 progress map from the Standard coal mine shows about 14 structures on the south 1/2 of the town. A prominent row of square houses, later named “Red Row” because they were all painted red, sat in a straight line oriented north-south along Flagg Drive. William P. Waneka, Jr., Chuck Waneka’s father, traded a cow to Bill Hurst for one of the houses in the 1920s. The same house sits on the southeast corner of the Waneka Centennial Farm on Baseline Road. It’s likely that Edward L. Doyle (1886-1954), United Mine Workers of America Dist. 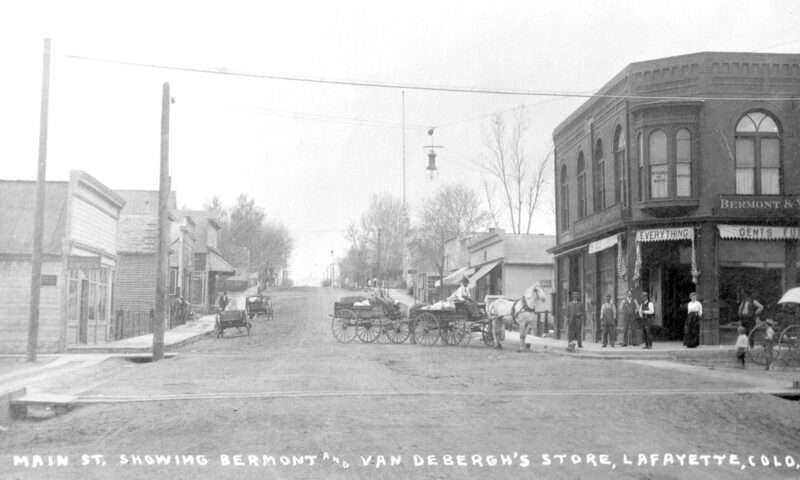 15 secretary based in Denver from 1912 to 1917, was a resident of Irvington from 1908 to 1912. Doyle is better known for his involvement in the fateful 1914 Ludlow Massacre, where he played a key role in communicating to national media the union’s perspective of the killings. As part of that job, he corresponded regularly with labor activist Mother Jones and with author Upton Sinclair, who wrote “King Coal,” an expose on the dangerous conditions Colorado coal miners faced. Doyle was entrusted by Sinclair to proofread “King Coal” for accuracy prior to its release in 1917. In 1909, Doyle worked as a checkweighman at the Capitol mine south of Flagg Drive where he advocated for miners’ safety, including dogging the mine’s owner to remove snow and ice that regularly blocked the mine’s escape shaft after snow storms. Doyle worked his way into leadership of Lafayette Local 1388 during the first few years of the Long Strike (1910-1914), where he organized the group’s civil disobedience efforts. Doyle aggressively rooted out turncoat union members hired by coal operators to spy on the organization. He also planted two of his own union men, hired from out-of-state, who posed as scabs in each local coal mine. Entrepreneur John “Jack” Gordon of Lafayette bought Lot 12, Bock 2 in Irvington in Aug. 1924 and then bought 210 South Public Road (Lots 6 and 7, Block 7) in Lafayette from Rocky Mountain Fuel Co. in Nov. 1924. He then moved the Hi-Way Food Market grocery store (built in 1908 and now Cannon Mine Coffee at 210 S. Public Road) from Irvington to Lafayette. Cundalls, Calvos and Milburns were some of the familiar Lafayette families that have resided in Irvington.